The results indicate that out of all the vehicles, the electric vehicles are the most competitive—both from an ecological and economic perspective. 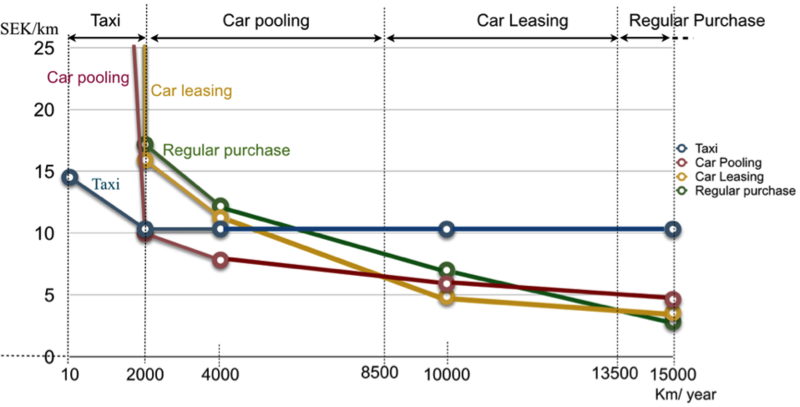 Moreover, of all the business models, Car Pooling is the most competitive when driving short to medium distances, reducing CO2-emissions by 20-40% compared to Regular Purchase. Meanwhile, Car Leasing emits the same amount of CO2-emissions as Regular Purchase if both are driven the same number of kilometres per year. The results also indicate that from a cost effectiveness perspective, people who travel less than 2000 kilometres per year should primarily consider using Taxi or similar services, while Car Pooling is most cost effective for those who travel from 2000 to 8500 kilometres. For those who travel between 8500 and 13500 kilometres per year, Car Leasing is the most cost effective, and Regular Purchase is the best option above 13500 kilometres per year. Published as: Nurhadi, L. et al., Competitiveness and sustainability effects of cars and their business models in Swedish small town regions. Journal of Cleaner Production, (Systematic Leadership towards Sustainability). In Press.